Looking forward to fresh tomatoes from my own garden! I’ve been wanting to grow some more things to eat, and thought a tomato plant would be a fun experiment. 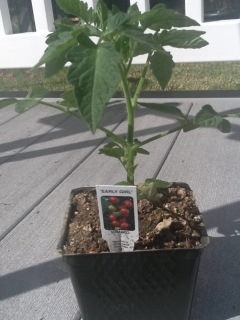 Hope to be back in about 60 days or so with pictures of tomatoes from this little plant! Now I’m off to Home Depot to find a nice home for this Early Girl! This entry was posted in garden and tagged Early Girl, Garden, Home, Tomato, Vegetables.